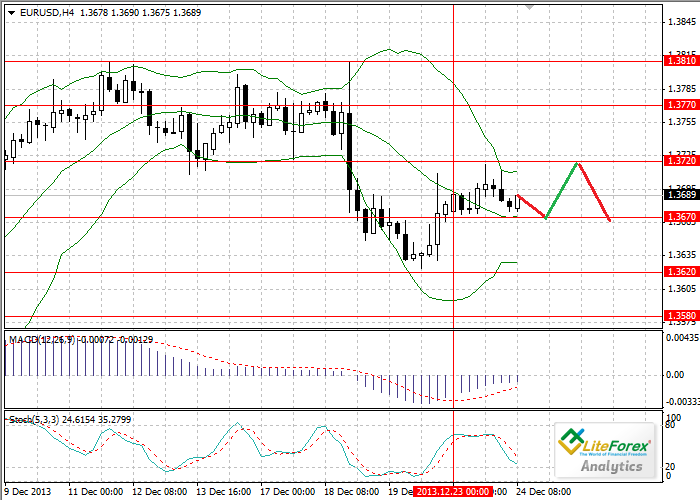 Since Monday the currency pair EUR/USD has traded in the upper band of the indicator “Bollinger bands” (1.3720-1.3670). The beginning of the holiday week has had soothing effect on the pair, which continues to trade in flat. The US data on number of orders for durable goods in November will become known today. It is expected that the index will increase by 1.7%, which can lead to the decline of quotes of the pair up to the lower limit of the range (1.3670). On the four-hour chart technical indicators demonstrate mixed signals, which is typical for the quiet market. Bollinger bands are getting horizontal. MACD histogram is in the negative zone, its volumes are decreasing. Stochastic lines are directed downwards. Resistance levels: 1.3720, 1.3770 and 1.3810. Support levels: 1.3670, 1.3620 and 1.3580. In the current situation it makes sense to open short positions at the current price with profit taking at the level of 1.3670.